All games were decisive in round 4 of the Russian Championship Superfinal, and afterwards Alexander Morozevich and Alexander Grischuk demonstrated their wins for the local audience and those watching the video broadcast. Vladimir Barsky transcribed their comments for the official website, and I’ve translated them below. 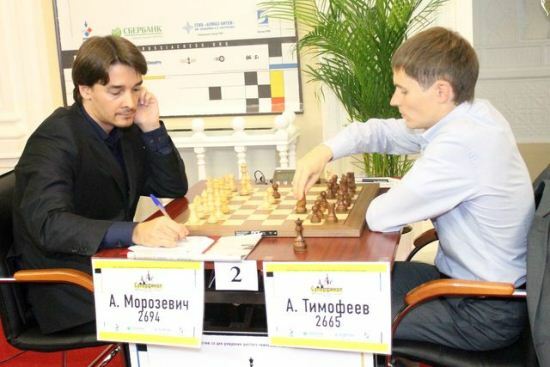 It’s fair to say Alexander Morozevich’s win over Alexander Timofeev wasn’t the toughest of his career, but any Morozevich win is a delight for his legion of fans. He’s now moved up to no. 17 on the live ratings list. 1.d4 d5 2.c4 dxc4 3.e4 Nf6 I expected the Queen’s Gambit Accepted, but after 3.е4 Artyom usually plays 3…Nc6, and my preparation was mainly reduced to that move. Fortunately I’d guessed that I also needed to look at 3…Nf6. 9…Bc4 Mainline theory here is 9…Qd7 10.Ne4 Bd5, while the move 9…Bc4 is considered a little dubious. 10.Bxc4 Nxc4 11.e6 fxe6 12.0-0 A few games have been played on this theme, perhaps not at the very highest level, but Black’s always experienced problems. I thought: maybe he’s got something in mind? 12…Nb6 The main line I had written down is 12…Qd7 13.Qb3 Nb6 14.Rd1 0-0-0 15.a4 or 15.Ne4 – Black doesn’t fully equalise. 13.Ne4 g6 13…e5 14.dxe5 – an advantage free of charge. 14.Nc5 I simply couldn’t understand his idea; it seems as though I’m making the most logical moves. 14…Qd6 This move simply stunned me: giving up the b7-pawn with tempo – that’s really something! I’d calculated 14…Qd5 15.Be3 e5 16.Nc3 Qc4 17.dxe5 (17.d5 Nd4 is worse) with an advantage. 15.Nxb7 Qd5 16.Be3 Bg7 16…Nc4 17.Bf2 looks pointless – Black’s knight will simply hang. 17.Nf4 Qf5 18.Rc1 There was a trap here: 18.Nc5 Nxd4 19.Bxd4 0-0-0. 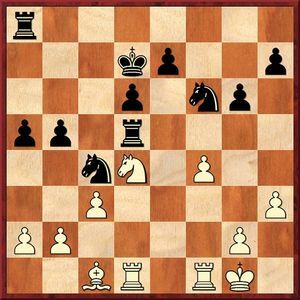 18…Nxd4 19.Bxd4 Bxd4+ 20.Qxd4 e5 21.Qb4 It seems to me that whatever White plays here he has an advantage. 22…c6 22…Kf7 23.Qb3+ Kg7 24.Rxc7 – Black doesn’t manage to regroup. 23.Qxc6+ Kf7 24.Nc5 Qd4+ It’s hard to play with queens on. 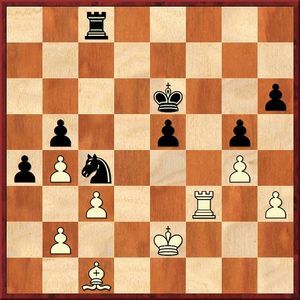 Here if 24…Rhc8 there’s the following tactic: 25.Qe6+ Kf8 26.Qxc8+. 25.Kh1 Qd5 Black has to exchange queens and look for some sort of practical chances on account of the fact that his king is closer to the centre. 26.Qxd5+ Nxd5 27.Nd3 Kf6 28.Rc6+ e6 29.Re1 Rhc8 30.Ra6 Rc2 31.h4 A logical move: I give myself some luft, take control of the g5-square and maintain all my options. 31…Rc4 32.Re4 Rd4 Looking for practical chances. 33.Nc5 Nf4 34.Rxd4 It was possible simply to retreat – 34.Re3. 36.b4 It was also possible to take a piece: 36.Ne4+ Ke5 37.gxf4+ Kxf4 38.Kg2 Rc2+ 39.Nf2 e5 40.b4 Ke3 (40…d3 41.Rd6 d2) 41.Ra3+. But I thought that in time trouble I might blunder something. 37.Rxe6+ Originally I was planning on playing 37.a3 Rxc5 (the only chance) 38.bxc5 d3 39.Ra4. Artyom hadn’t seen this move at all, but I saw it. 39…e5 40.Ra6+, and here it seemed to me that Black starts creating a study: 40…Nb6 41.cxb6 d2. But there’s no study, if only because of: 42.b7+ Ke7 43.Rd6. But I didn’t see that and thought the pawn would promote. I don’t know why I thought that: the variation doesn’t seem to be the most complex. 37…Kf7 37…Kf5 38.Re4 Nxb4 39.Nd7, and Black doesn’t have a normal defence from two mates. But now such “intricate” ideas don’t work for White because he’s lost the most important pawn. 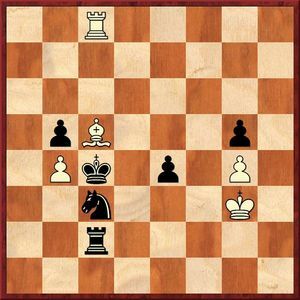 38.Ra6 Nxb4 He made this move too slowly and lost on time. After 39.Rxa7+ White maintains practical winning chances, but it appears to be the best position Black’s had in the game after the 14th move. 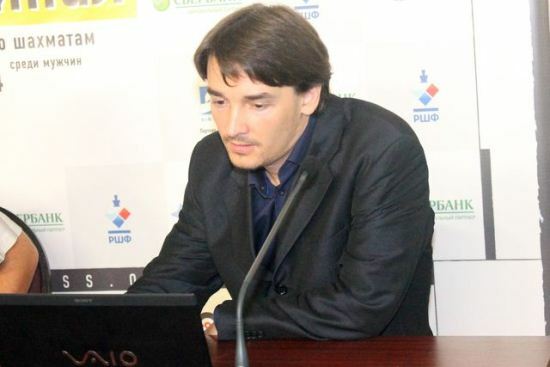 You can still watch the video of Morozevich’s demonstration of his game (where he of course speaks Russian), at the official website. Sergey Karjakin came back to earth with a bump after his win against Vladimir Kramnik. 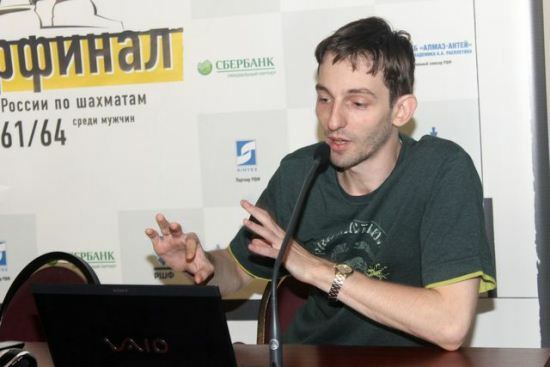 Although the Ukrainian player clearly wasn’t at his best, Sergey Shipov described Alexander Grischuk’s win as a “positional masterpiece”. 1.e4 d6 2.d4 Nf6 3.Nc3 g6 Only a win suited me, which is why I played such an opening as the Pirc-Ufimtsev Defence. Sergey has had it a lot recently in his games against Ivanchuk. Sergey crushed him in the tournament in Bazna (Romania), while at the World Team Championship Ivanchuk managed to survive. It would be better if it had been the other way around – in Romania a draw, but a win in Ningbo! 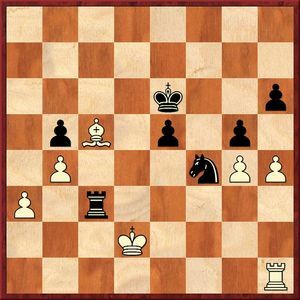 4.f4 Bg7 5.Nf3 c5 Ivanchuk castled on both occasions, while c5 is the second main move. 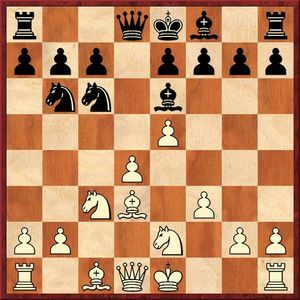 6.Bb5+ Bd7 7.e5 Ng4 8.e6 fxe6 9.Ng5 Bxb5 10.Nxe6 Bxd4 11.Nxb5 An awful lot of people know that you can make a draw in this position: 11.Nxd8 Bf2+ 12.Kd2 Be3+. 12…Qxd2+ This move is encountered less often, but it’s got a better reputation. The main theoretical continuation is – 12…Bf2+ 13.Kd1 Ne3+ 14.Ke2 Qxb5+ 15.Kxf2 Ng4+ 16.Kg3 Na6, and Black has quite a dangerous position. 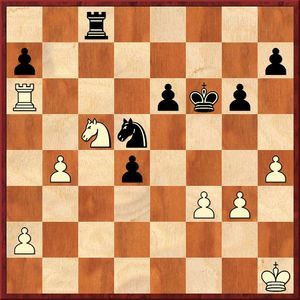 You just have to make sure you don’t take the g4-knight (it’s won back after Qd7, Kf7, Nc7). 13.Bxd2 Kd7 14.Nbxd4 The principled continuation here is – 14.Nec7 a6 15.Nxa8 axb5 16.a4 bxa4 17.Nb6+ Kc6 18.Nxa4. 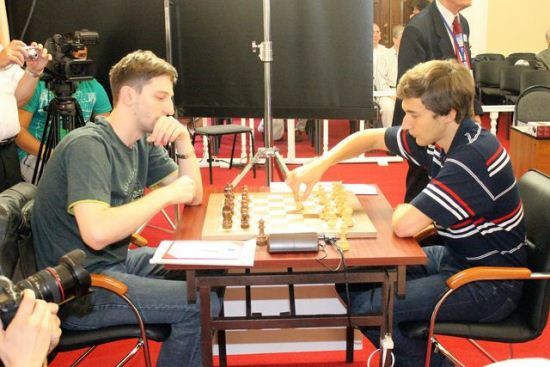 You get a very sharp ending, which was seen in the games Radjabov – Ivanchuk and Muzychuk – Hamdouchi. It seems Sergey wasn’t prepared for that line as he played quite toothlessly. 14…cxd4 15.Nxd4 It’s clear that this position has huge drawing resources, but if people want to play for a win then that’s also an option. 15…Rc8 This move is recommended by the computer, and I decided to trust it. 16.0-0 Rc5 It’s hard to say if Sergey wanted a real fight or not. But he started to play poorly here. 17.c3 Nc6 18.Nf3 b5 19.h3 19.a4 bxa4 20.Rxa4 Rb8 21.b4 Rc4, and White’s got nothing. 19…Nf6 20.Be3 Rd5 21.Nd4 Na5 If I want something then I have to jump somewhere. 22.Rad1 Nc4 23.Bc1 a5 I think Black’s better here. Strangely enough, the rook is very strong on d5. Sergey decided to exchange it – at the cost of a couple of tempos. 24.Nc2 Rxd1 25.Rxd1 Rc8 26.Kf1 Nb6 Dangers are beginning to emerge for White – Black wants to play b5-b4. It was necessary to play 27.a3, but after 27…a4 the two black pawns cancel out White’s three pawns and therefore I end up with an extra pawn in the centre. 28.Rd4 Nfd5 It’s difficult to comment here as time trouble was starting. It seems to me that the way we played from here onwards was reasonable. Without e7-e5 it’s hard for me to make progress, and in order to play e5 I have to block the d-file. 29.Ke2 e5 30.fxe5 dxe5 31.Rd1 Ke6 32.Rf1 I was sure that Sergey would play 32.Ne1. I really didn’t like this move. 32…Nc4 33.Rf3 I didn’t particularly understand this manoeuvre. 33…h6 34.Nb4 Nxb4 35.axb4 g5 36.g4 When you’ve got such an overwhelming position you want to prevent any counterplay at all. Here I probably started to get a bit too clever. 36…Rg8 After a normal move like 36…Rd8 there might follow 37.h4 gxh4 38.Rh3. But with the rook on g8 in that line the g4-pawn will hang. 37.Rf1 Nb6 A promising plan – transferring the knight to f4. I think if you exchange rooks then Black will be winning, but there’s no way of exchanging them: if 37…Rg7, then 38.Rf8, and the white rook becomes active. 38.Be3 Nd5 39.Rh1 Rc8 Here I set a trap and he fell for it. 40.h4 Better was 40.Bc5; perhaps I shouldn’t have allowed that bishop move. 40…a3! 41.bxa3 Rxc3 42.Bc5 42.Bd2 Nf4+, and Black is winning. Interesting is 42.hxg5 Rxe3+ 43.Kd2 hxg5 44.Rh6+ Ke7 45.Rh7+ Kf6 46.Rh6+ Kg7 47.Rd6 – the knight’s won back and you get a draw. But after 43…Rxa3 44.gxh6 you get a position which is very similar to my second game in the match against Gelfand in Kazan. Incredibly similar – it gave me goose bumps! 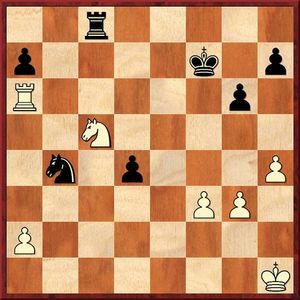 But Sergey correctly pointed out that the move 44…e4 was winning, and after 45.h7 Ra2+ I take the rook. 43…Rxa3 Later on I regretted not including the check 43…Rd3+ here, but that was very tricky to foresee in advance. 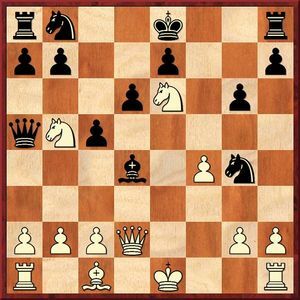 44.hxg5 hxg5 45.Rh8 Kd5 I have to try and weave some sort of mating nets in order to use the power of the knight. 46.Rd8+ Kc4 47.Re8 Kd5 48.Rb8 Kc4 49.Re8 Ra2+ If Black had included the check on the 43rd move the white king would now be standing on c2 and would have to retreat to the back rank. 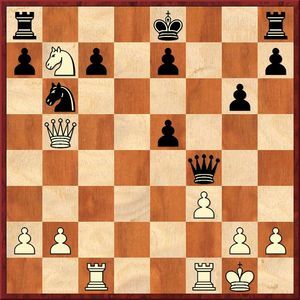 50.Ke3 Nd5+ 51.Kf3 All White’s moves are only moves: 51.Ke4? Nf6+. 51…Ra3+ 52.Ke2 52.Kf2 Nf6, and you can’t take the e5-pawn because of the fork. 52…Nc3+ 53.Ke3 Ra2 I was lucky to find such a move, after which White can’t take on e5. Now he’s probably lost, although I’m not 100% certain. 57.Kh3 57.Be3+ Kd3 58.Bxg5 Ne2+, and Black wins the rook. 57.Be7+ Kb3 58.Re8 Ne2+ 59.Kf2 Nf4+ 60.Ke3 Nd5+, and Black wins, because you can’t take the pawn: 61.Kxe4 Nxe7 62.Rxe7 Re2+. 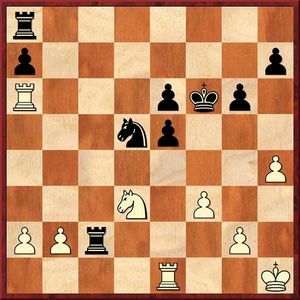 57…Nd5 Threatening mate in two, so White is forced to exchange rooks. 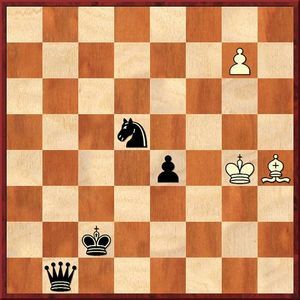 White resigned, as he loses the “newly-born” queen. You can watch Grischuk’s demonstration as a video highlight at the official website. I like the look of this whychess website! Are all those GM’s going to blog regularly? Grischuks first one was good. I like his attitude ad more so the way he plays chess. Back slapping for ‘nearly winning’ I dont agree with either. 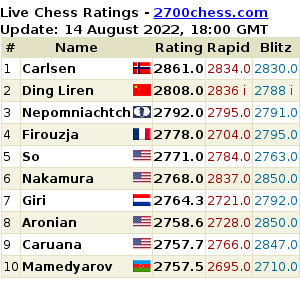 As a general rule I’d observe that busy top-GMs probably aren’t the most reliable bloggers, but fingers crossed! The plan’s definitely to have regular contributions. And pray how do you decide which ones are to grace this site rather than whychess? I guess you spotted it wasn’t very systematic! :) Mainly when I found I was translating far too much (and for understandable reasons it wasn’t being translated into French at WhyChess) I translated some things here. I think I’ll still add a couple of demonstrations. I’ve also got a few long-term Chess in Translation projects I’d finally like to get round to!